Nearly 100 million journeys start or end in London’s Waterloo rail station each year, making it the busiest rail hub in England’s capital city by far. All that traffic can unsurprisingly lead to chaos and confusion among passengers as they hurry across the concourse looking for their trains. Luckily, Waterloo is being outfitted with sleek new mobile technology that will enable the station’s employees to better guide passengers towards their destinations. 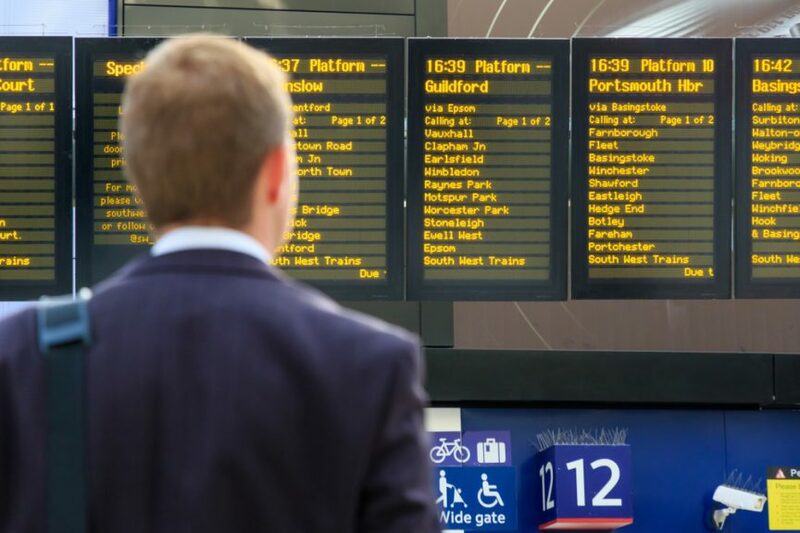 Mobile devices will now feed real-time information on the status of trains to station employees, who previously had to rely on either physical schedules or the standard National Rail Enquiries data feed that connects to digital displays throughout the station. The move will reduce the risk of employees incorrectly advising passengers based on outdated information, and hopefully, decrease congestion by simplifying the path that passengers take across the concourse. With so many people traveling in and out of Waterloo each day, the station needs to be kept as orderly as possible, or foot traffic quickly accumulates. Service staff are vital to ensuring that passengers understand where they’re going and how they’re getting there, so equipping that staff with real-time information is a tremendous step in the right direction for Waterloo. Along the same lines, the station has also moved to ensure its service desks are fully staffed at all times, rather than only during peak hours. That’s no small feat, given that Waterloo must staff enough employees to adequately serve more passengers during these peak hours than many routes experience throughout the entire day. Waterloo’s move is just the latest episode in a long-running trend in UK rail that is putting the latest in mobile technology in train stations in order to boost efficiency. A few years ago at Birmingham International railway station, Richard Branson’s Virgin Trains did away with ticket desks in favor of “welcome desks” with touch-screen service stations that passengers could use to look up trip information and purchase tickets. Virgin also introduced an Explorer App that made it far easier for passengers to navigate stations and make their trains on time. Passenger trains in the UK have also been doing their best to improve standards for punctuality. Whereas in the past trains were considered “on time” so long as they showed up within five to ten minutes of their expected arrival time, rail companies throughout the country have moved to consider any train that doesn’t show up exactly on-time as late. Moreover, conductors are expected to note and report the times at which they arrive at every station along a given train’s route. All these steps are sure to make trains more enjoyable and efficient for the UK’s millions of rail passengers. Waterloo’s new initiative offers just one example of how modern technology is so effective at improving service and safety for rail operators — another example is Midwest Industrial Supply, Inc.’s line of innovative rail switch lubrication products, which the country’s rail operators need to maintain their infrastructure and, in turn, honor their commitment to timely travel. Mechanical problems and equipment failure are the most common cause of transit delays. With over 40 years of experience in the railroad industry, Midwest has the knowledge and expertise needed to prevent these failures by ensuring rail switches remain continually lubricated throughout the year, regardless of conditions. Our switch lubrication product Glidex® can be applied to rail switches, car couplers, and other vertical surfaces without sliding off with precipitation. Designed in collaboration with NASA, it lasts longer than graphite- and petroleum-based products without corroding the surface or damaging the surrounding environment. There are many ways to make sure rail lines run on time — while Waterloo guides passengers to where they need to be, we can do the same for trains as they travel from station to station throughout the UK…and the world.